These 2017 S Proof American Silver Eagle and 2017 S Proof Kennedy Half Dollar are the most demanded coins from the 2017 US Mint Limited Edition Silver Proof Set. 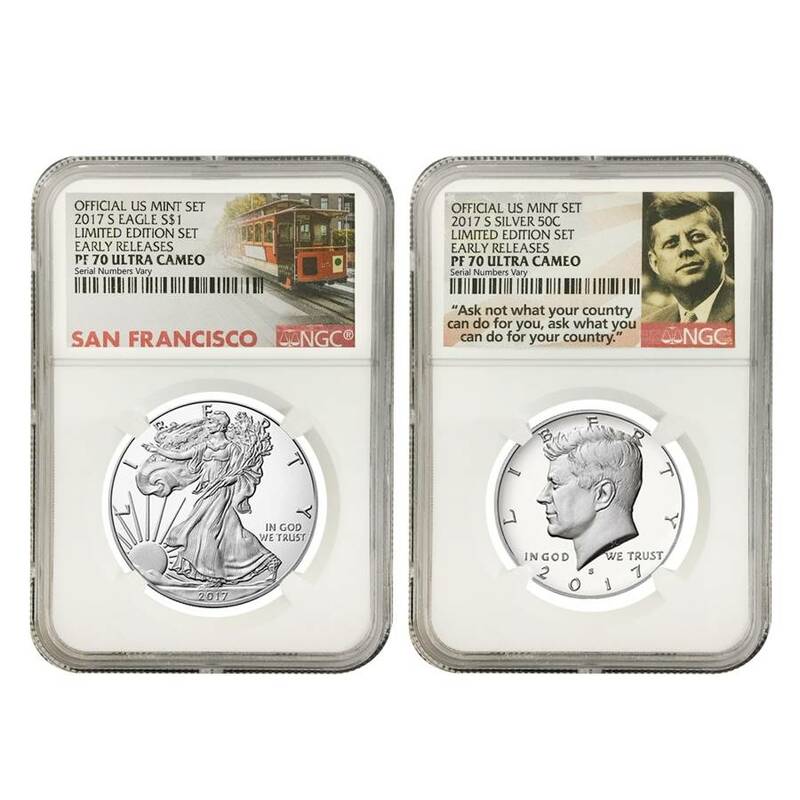 Both coins were struck multiple times by polished dies at the San Francisco Mint to create the perfect Proof condition. The .999 fine Silver American Eagle and the 90% Kennedy Half Dollar are respectively one dollar and fifty cents United States legal tender. The well-known design and limited mintage of these coins make them a great addition to any precious metals portfolio. 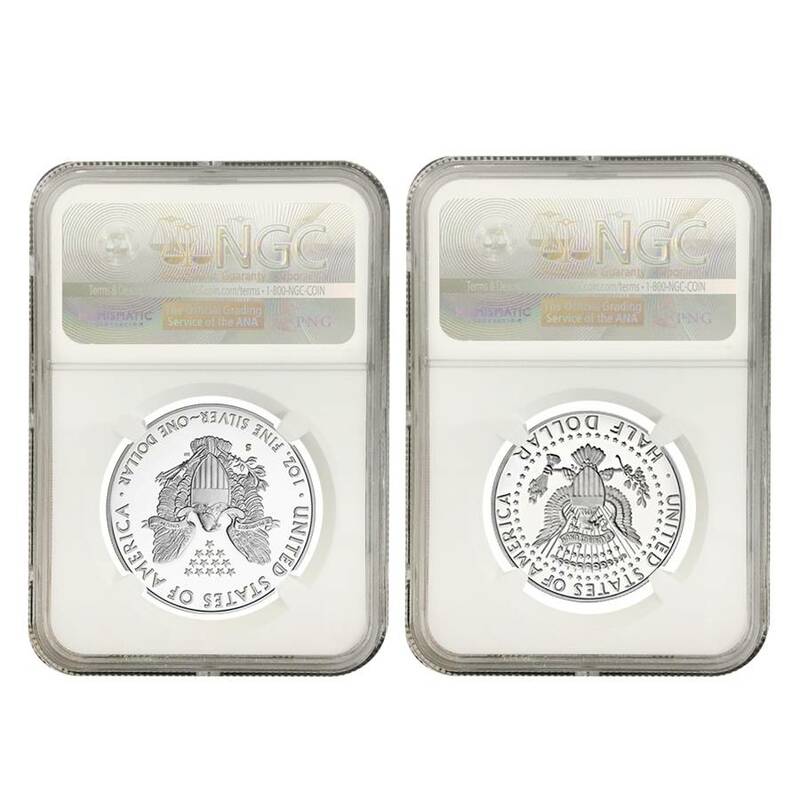 Both coins were certified by Numismatic Guaranty Corporation (NGC) within the first 30 days after the official release as Proof 70, that means these coins have no imperfections and show all features and fields exactly as the engraver and mint intended. Silver American Eagle made of .999 fine silver, with a weight of 1 oz. Kennedy Half Dollar made of 90 % silver, with a weight of 0.3617 troy oz. Produced by the U.S. Mint at San Francisco facility. NGC PF 70 - Proof coins with no post-production imperfections at 5x magnification. 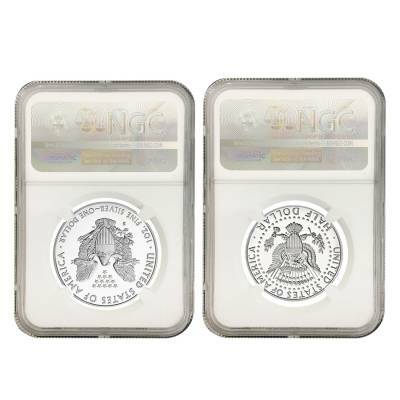 Silver American Eagle comes in NGC Early Releases holder with Trolley Label. Kennedy Half Dollars comes in NGC Early Releases holder with Kennedy Label. Coins Design: Silver American eagle features Adolph A. Weinman's iconic Walking Liberty on the obverse and John Mercanti stoic heraldic eagle on the reverse. Kennedy Half Dollar features the Gilroy Roberts portrait of President John Kennedy on the obverse and Heraldic Eagle reverse designed by Frank Gasparro. At Bullion Exchanges, you will find only high-quality bullion at very competitive prices. Order these coins today simply by clicking on ‘Add to cart’ and they will be delicately wrapped, packaged and shipped to your address. If you have any questions, just contact us by phone at 800.852.6884 or write us a message, we will be happy to assist you. For every $1 spend, you will earn 1 Bullionaire Buck which is equivalent to $0.001 off a future purchase. 290 BB = $0.29.